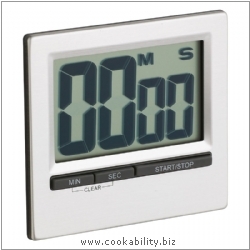 Deluxe chromed, digital countdown timer. Timer counts down for up to 99 minutes 59 seconds. Fold out display stand and magnetic fixing. The unit has a large clear LCD display and loud alarm. Requires 1xAAA battery, not included.